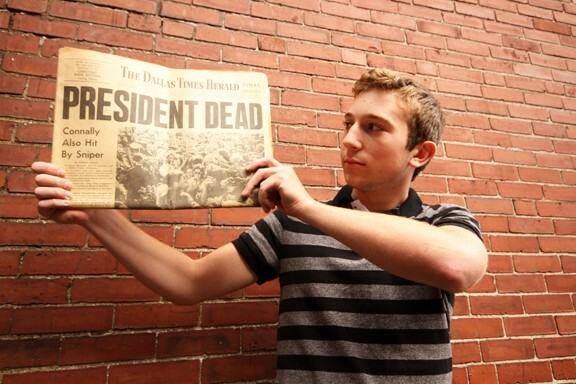 As the nation prepares to observe the 50th anniversary of President John F. Kennedy’s assassination in November, a local high school student is preparing an exhibit that asks a number of questions regarding the reported facts about the events of that day. The exhibit will open at Motorland Vintage America, located at the North Dam Mill in Biddeford, on Friday, Oct. 25, at 5 p.m. during the monthly Biddeford+Saco ArtWalk.According to Caleb Delano, a 15-year-old, home-schooled freshman from Waterboro, the U.S. government should re-open the case into Kennedy’s assassination on Nov. 22, 1963. Delano recently began an internship at Motorland Vintage America, where he has been researching the assassination and discovering unanswered questions about what really happened in Dallas on Nov. 22, 1963. This is the second year that Motorland Vintage America has offered internships to local high school students interested in history, art or automotive studies who want real-world experience in their particular field of study. Delano is designing a special memorial exhibit that will combine period artifacts with social media to remember and honor the slain president and encourage a new generation to form their own opinions on whether the case is closed or whether there is reasonable doubt. Delano has worked with the owner of Motorland Vintage America, Tim Stentiford, to catalog more than 200 vintage documents, newspapers, magazines and books from the Motorland collection, which were all written at the time of the assassination.